Holiday.gr - Makrinitsa, a trip to a myth! Half-hour drive and an enjoyable stroll through the narrow roads will bring the visitor to the central square of Makrinitsa. 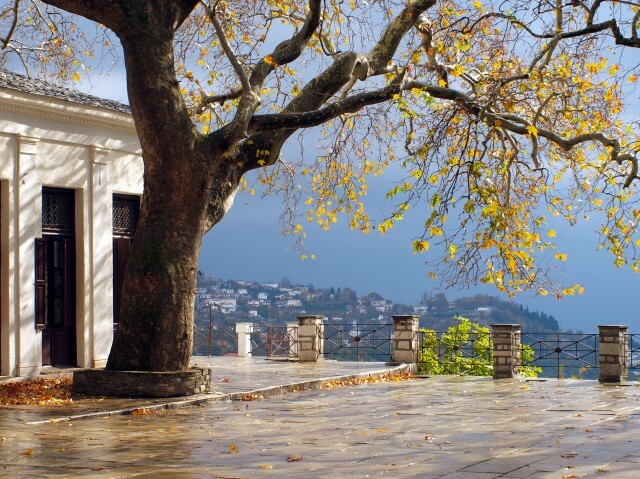 Panoramic view of Volos, of the beautiful city of Jason and Pagasitic gulf, a huge mirror in the arms of Pelion. 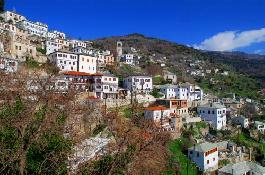 The renowned village, Makrinitsa is built incrementally on the mountainside where the lowest point of elevation is 350 meters and the higher 700. It is noteworthy that Makrinitsa kept unchanged its traditional style in time. The picturesque cobbled paths, the traditional stone houses and beautiful mansions preserved traditional architecture. Among the refurbished mansions there are some well-known families such as Topali mansion that houses the Folklore Museum. Many of the old mansions serve as hostels offering guests a comfortable stay in an environment where the past is alive. At the village square with the plane trees you can have a coffee and enjoy the magnificent view. Also, at the wall of the cafe in the square you will have the opportunity to see the famous fresco "Cold War in the Fountain" of painter Theophilos. Been to Makrinitsa ? Share your experiences!